Thomas Jefferson wrote the Declaration of Independence, asserting the natural dignity of the human person, that God has given man certain inalienable rights, among them Life, Liberty, and the pursuit of Happiness. The idea of human dignity, that we are created in the image of God, forms the theological basis for human equality and liberty. The Declaration of Independence serves as the perfect philosophical expression of our Biblical heritage and establishes the core principles of our Nation, the United States of America. The American colonists wanted freedom to live their own lives, freedom to practice their own faith, freedom from intrusions and unfair taxation by the British. After England won the Seven Years War over France, France ceded Canada to the British in the Treaty of Paris in 1763. England then demanded tighter control over the British colonies. The Proclamation Act of 1763 restricted Americans from moving westward. To raise money to pay for the war, the British implemented a series of taxes upon the American people, such as the Sugar Act of 1764, the Stamp Act of 1765, and the Townshend Acts of 1767. The Quartering Act of 1765, which ordered colonial towns to provide barracks for British troops, further inflamed the Americans. A spirit of independence arose in the American colonies. Samuel Adams formed the Sons of Liberty in 1765, a secret organization that began in Boston to oppose the Stamp Act, but one that rapidly spread to all the colonies. English Parliament claimed they had the right to tax the colonies without input from the American people. Taxation without Representation became a rallying cry throughout the colonies. England sent four regiments of British redcoats to Boston on October 1, 1768. In a disagreement on March 5, 1770, redcoats opened fire and killed five unarmed colonials, which became known as the Boston Massacre. This tragedy and the unfairness of the Tea Act of 1773, which required tax on British Tea when there was no tax on Dutch tea, led to rebellion. Trusting that God would free them from the tyranny of the British, Americans rallied in Faneuil Hall on December 13, 1773, three days before the Boston Tea Party, and during the War of American Independence. To quote the Lexington Minutemen: "We trust in God that, should the state of our affairs require it, we shall be ready to sacrifice our estates and everything dear in life, yea, and life itself, in support of the common cause." In the Boston Tea Party of December 16, 1773, Americans dumped 342 chests of English tea into Boston harbor. This led the British government to pass what was called by Americans the Intolerable Acts of 1774. These punitive measures further galvanized the colonies to assemble at the First Continental Congress and form the Continental Association, which met in Philadelphia, Pennsylvania from September 5 to October 26, 1774. On September 17, the Congress first endorsed the Suffolk Resolves, which declared the Intolerable Acts unconstitutional and called for a volunteer militia. Twelve states (all but Georgia) signed the Articles of Association on October 20, 1774. The Association called for a boycott of all English goods, beginning December 1, 1774. On March 23, 1775, before the Virginia House of Burgesses at St. John's Church in Richmond, Patrick Henry set the mood for the American colonies when he asserted "Give me Liberty or give me Death!" On the night of April 18, 1775, on a signal from two lanterns in the bell tower of Boston Old North Church, Paul Revere and his messengers rode out to Lexington and Concord, within 20 miles of Boston, to warn the Minutemen that "the British are coming." At dawn on April 19, 1775, British redcoats opened fire and killed eight colonists in Lexington; by the time the British Army reached Concord, the Americans had mobilized and defeated the Redcoats. The War of American Independence had begun. On June 7, 1776, Richard Henry Lee of Virginia made a motion for independence of the United Colonies. A motion to defer voting was made, and on June 11, Congress appointed a committee of five to prepare a Declaration of Independence: Thomas Jefferson, John Adams, Benjamin Franklin, Roger Sherman, and Robert R. Livingston. Thomas Jefferson was given the task of writing the first draft. On July 1, 1776, the Second Continental Congress reconvened, and John Adams of Massachusetts delivered a stirring speech for independence. The following day all thirteen colonies voted for independence. On July 4, 1776, the Declaration of Independence was approved by 56 representatives of the Thirteen States. 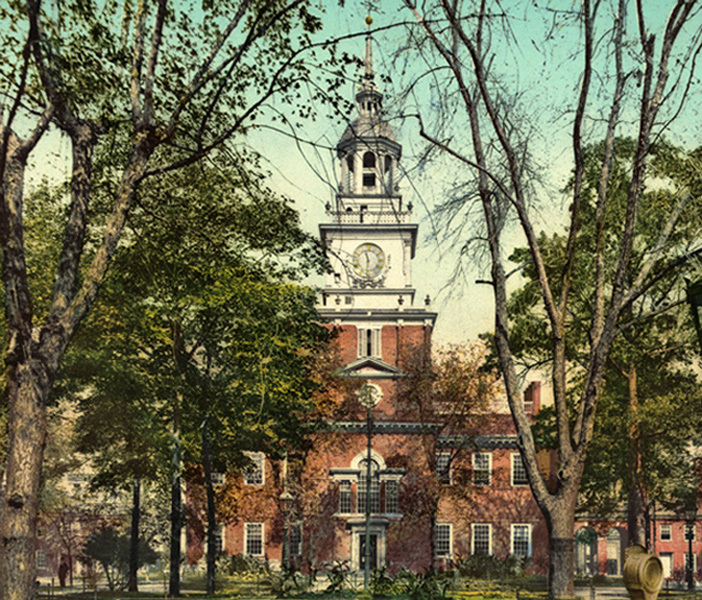 The first public reading of the Declaration of Independence took place in Philadelphia on July 8, 1776, as the Liberty Bell rang out from Independence Hall. The Declaration of Independence records the first time that our country was referred to as the United States of America. But when a long train of abuses and usurpations, pursuing invariably the same Object evinces a design to reduce them under absolute Despotism, it is their right, it is their duty, to throw off such Government, and to provide new Guards for their future security. Such has been the patient sufferance of these Colonies; and such is now the necessity which constrains them to alter their former Systems of Government. The history of the present King of Great Britain is a history of repeated injuries and usurpations, all having in direct object the establishment of an absolute Tyranny over these States. The Declaration of Independence was signed by 56 men who risked their fortunes, reputations, and their very lives for the independence of our Nation. They were Thomas Jefferson, Carter Braxton, Benjamin Harrison, Francis Lightfoot Lee, Richard Henry Lee, Thomas Nelson Jr, and George Wythe of Virginia; Charles Carroll of Carrollton, Samuel Chase, William Paca, and Thomas Stone of Maryland; John Adams, Samuel Adams, Elbridge Gerry, John Hancock, and Robert T. Paine of Massachusetts; Benjamin Franklin, George Clymer, Robert Morris, John Morton, George Ross, Benjamin Rush, James Smith, George Taylor, and James Wilson of Pennsylvania; Samuel Huntington, Roger Sherman, William Williams, and Oliver Wolcott of Connecticut; Thomas McKean, George Read, and Caesar Rodney of Delaware; Burton Gwinnett, Lyman Hall, and George Walton of Georgia; Josiah Bartlett, Matthew Thornton, and William Whipple of New Hampshire; Abraham Clark, John Hart, Francis Hopkinson, Richard Stockton, and John Witherspoon of New Jersey; William Floyd, Francis Lewis, Philip Livingston, and Lewis Morris of New York; Joseph Hewes, William Hooper, and John Penn of North Carolina; William Ellery and Stephen Hopkins of Rhode Island; and Thomas Heyward Jr, Thomas Lynch Jr, Arthur Middleton, and Edward Rutledge of South Carolina. 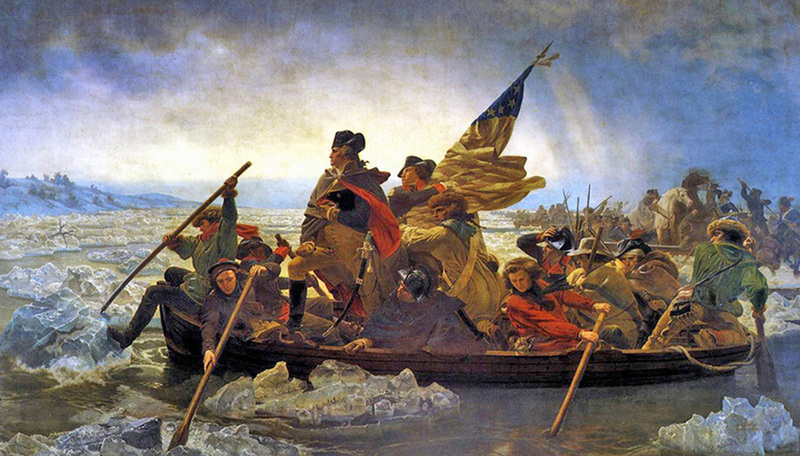 The first effort for George Washington and the Continental Army was to contain the British troops who held Boston. In a surprise maneuver during the night of March 5, 1776, the Americans mounted cannons atop Dorchester Heights, which overlooked Boston and left the British redcoats vulnerable. The British had no choice but to evacuate. When he learned that the British were organizing a massive fleet outside of New York during the summer of 1776, George Washington moved his troops to New York. The battle for New York began on August 27, 1776. The superior force and military training of the British Army under General William Howe won battle after battle in New York, as the Continental Army, which was outgunned, outnumbered, with little to no training or supplies, lost battle after battle in Brooklyn, Kips Bay, White Plains, and Fort Washington in the Fall of 1776. The Americans had no choice but to retreat into New Jersey. Despondent over defeat, desertions, and disease, the Americans left Trenton, New Jersey, to cross the Delaware River into Pennsylvania. But George Washington persevered, and, with his two loyal Generals Nathanael Greene and Henry Knox, again crossed the Delaware back into New Jersey on Christmas night, 1776, and was victorious in the Battle of Trenton on December 26. Surprise led to another quick victory at the Battle of Princeton on January 3, 1777. These two battles raised the morale and spirits of our new Nation. While the superior forces of the British could have provided a death blow to the American cause, the British generals lacked coordination. While General Howe took Philadelphia on September 26, 1777, General Burgoyne's march on northern New York ended in disaster as the American General Horatio Gates defeated the British at the two Battles of Saratoga on September 19 and October 7, leading to the surrender of Burgoyne's army on October 17, 1777. The Continental Congress passed the Articles of Confederation on November 15, 1777. The victory at Saratoga enabled Benjamin Franklin, the delegate of the Continental Congress, to secure recognition of American independence and support from France in the Alliance of February 1778. With the defeat of Burgoyne's army and General Howe essentially under siege at Philadelphia, the British decided upon a Southern strategy. The British initially enjoyed success in their Southern Campaign. The British Colonel Archibald Campbell landed in Savannah on December 29, 1778, and quickly captured the Georgia capital. The Redcoats successfully defended the city against a combination of American and French forces on October 9, 1779. However, they were unable to penetrate inland; the British hope that Loyalists would flock to their side never materialized. Admiral Marriot Arbuthnot transported Sir Henry Clinton to South Carolina and the Royal forces landed 30 miles south of Charleston at Edisto inlet on February 11, 1780. Charleston surrendered to the British on May 12, 1780. Clinton then turned over command of the Southern forces to General Charles Cornwallis. Congress appointed Horatio Gates to improve the situation in the South, but he suffered a disastrous defeat to Cornwallis at Camden, South Carolina on August 17, 1780. However, the Americans proved victorious at the Battle of King's Mountain, South Carolina on October 7, 1780. George Washington then appointed Nathanael Greene General of the Southern Army. His strategy of hit-and-run raids throughout South Carolina, with the aid of Francis Marion, the Swamp Fox, and General Daniel Morgan frustrated Cornwallis and the British. Morgan achieved a major victory at the Battle of Cowpens, South Carolina on January 17, 1781. Angered over defeat, the aggressive Cornwallis, who destroyed many of his supplies to move quickly, charged after Greene and Morgan, who wisely retreated through North Carolina across the Dan River into Virginia. The Articles of Confederation were finally ratified on March 1, 1781. Cornwallis won an empty victory at Guilford Court House, North Carolina on March 15, 1781, but suffered such heavy losses that he had to retreat towards the coast. The British then decided to attack Virginia and gain control of the Chesapeake. Cornwallis first headed to Richmond and gathered troops and supplies and then moved 7500 troops to Yorktown, and began building fortifications there. George Washington and the Comte de Rochambeau, who were planning an attack on Clinton in New York, changed course and directed the incoming French fleet of Admiral deGrasse to the Chesapeake. They then took a 400-mile march to join the Marquis de Lafayette at Jamestown, Virginia, and arrived there September 15. With the French fleet guarding the Chesapeake, and Washington and Lafayette in Jamestown, Cornwallis was surrounded and trapped in Yorktown. Fighting began on October 9, but the outcome was inevitable. It was the surrender of British General Charles Cornwallis to George Washington at Yorktown, Virginia on October 19, 1781 that effectively ended the War of American Independence. The formal Peace Treaty between the United States of America and Great Britain was signed at the Treaty of Paris on September 3, 1783. 1 Thomas Jefferson. The Declaration of Independence. Philadelphia, Pennsylvania, July 4, 1776. 2 Berkin C, Miller CL, Cherny RW, Gormly JL. Making America. Fourth Edition, Houghton Mifflin, Boston, 2006. 3 Morison, Samuel Eliot. Oxford History of the American People. Oxford University Press, New York, 189-223, 1965. 4 Spalding M. We Still Hold These Truths. Intercollegiate Studies Institute, Wilmington, Delaware, 2009. 5 Gragg R. The Declaration of Independence. Rutledge Hill Press, Nashville, Tennessee, 2005. 6 McCullough, D. 1776 - The Illustrated Edition. Simon & Schuster, New York, 2007. 7 Commager HS, Morris RB. The Spirit of Seventy-Six: The American Revolution as Told by its Participants. 1958; Reprint: Castle Books, Edison, New Jersey, 2002. 8 Higginbotham D. The War of American Independence. MacMillan, New York, 1971. 9 Martin JK, Lender ME. A Respectable Army: The Military Origins of the Republic (1765-1783). Second Edition, Harlan Davidson, Wheeling, Illinois, 2006. 10 Morrill DL. Southern Campaign of the American Revolution. Nautical & Aviation Publishing, Mount Pleasant, South Carolina, 1993.